This is a quickie post about a CP train that had a lot of "fallen flags" cars on it. 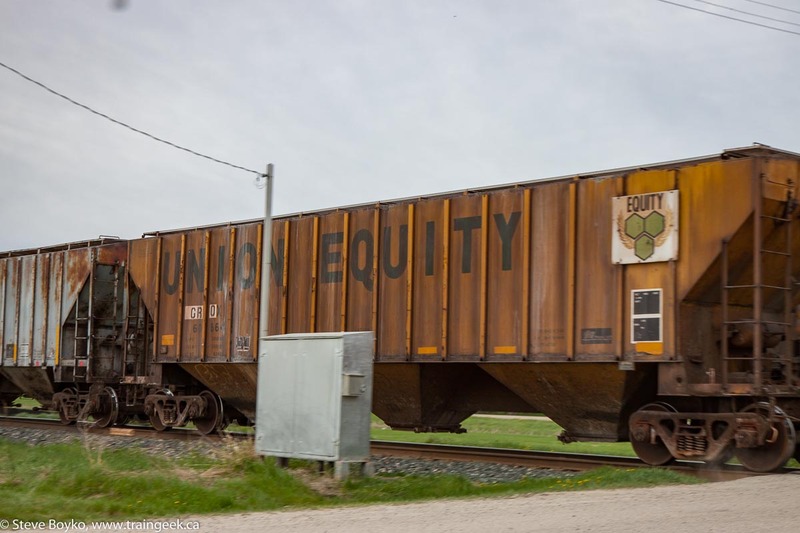 For railfans, a "fallen flag" is a railway that doesn't exist as that entity any more. It might be a railway that went bankrupt, or one that was absorbed into another through a merger or acquisition. There are many, many examples in history but here are three. All of these fallen flags were represented on this train. 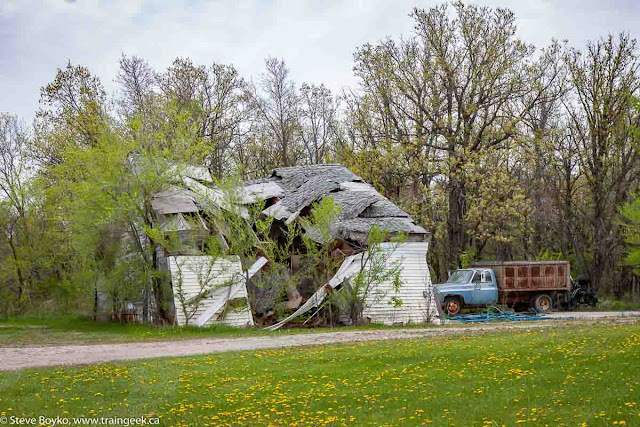 I was driving south of Winnipeg on highway 59 to get my tent trailer for the camping season. I store it for the winter on a farm near Otterburne, Manitoba. 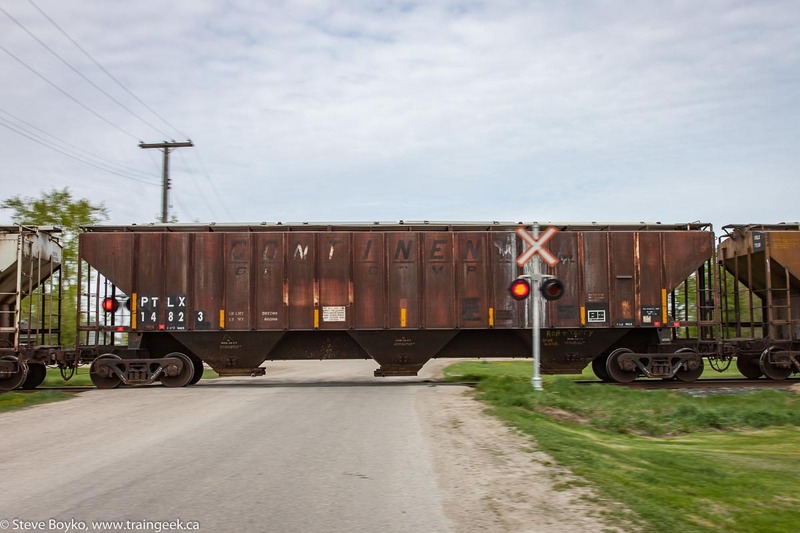 On my way down, I stopped in at Niverville to look at the ex Manitoba Pool grain elevator and see if any trains were in the vicinity. Niverville is on the CP Emerson subdivision that runs north-south between Winnipeg and the US border at Emerson, MB. 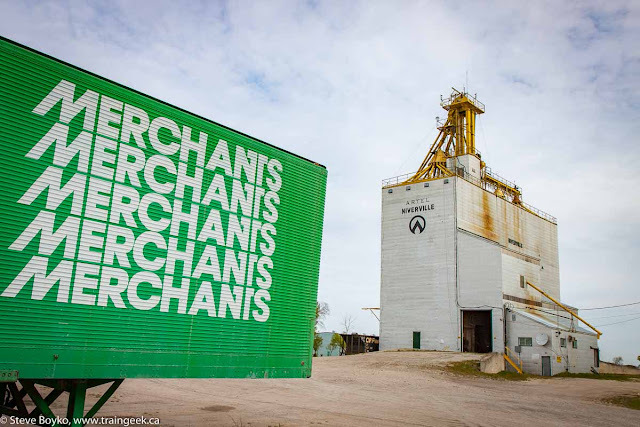 There were no trains but I took a few (more) photos of the Artel grain elevator and continued south. I drove past the farm and carried on into Otterburne to get trackside. I saw no trains to the north or south, but I did see an interesting collapsed building so I pulled over to photograph it. 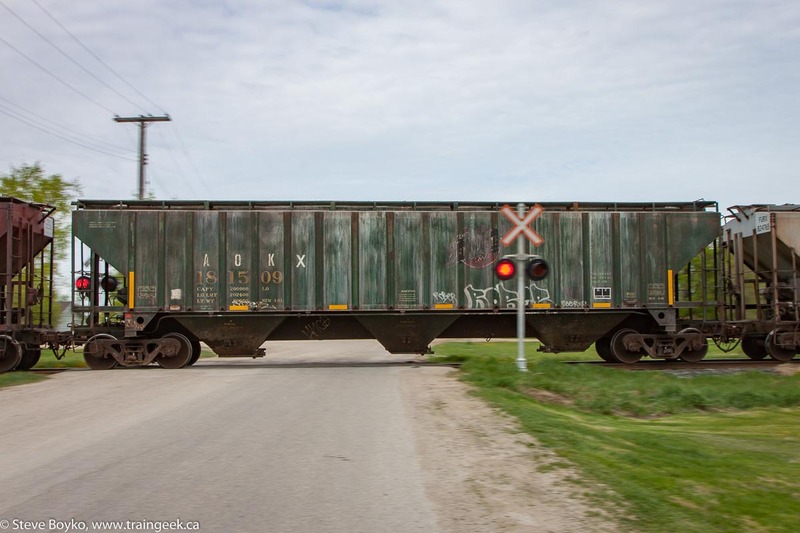 As I stepped out of my van I heard a train horn in the distance. 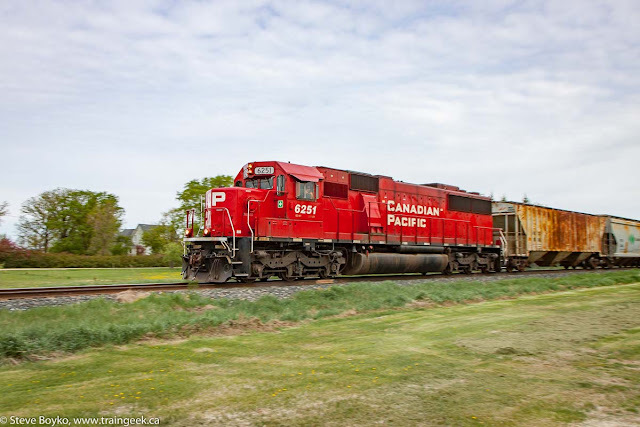 I sprinted over to the nearest crossing to capture CP 6251 South. It had just the one unit with a friendly conductor giving me a wave. Following them were a series of rusty old cars - some festooned with graffiti (ugh) but most mostly untouched. Maybe they were too rusty for people to tag? Here are some samples. 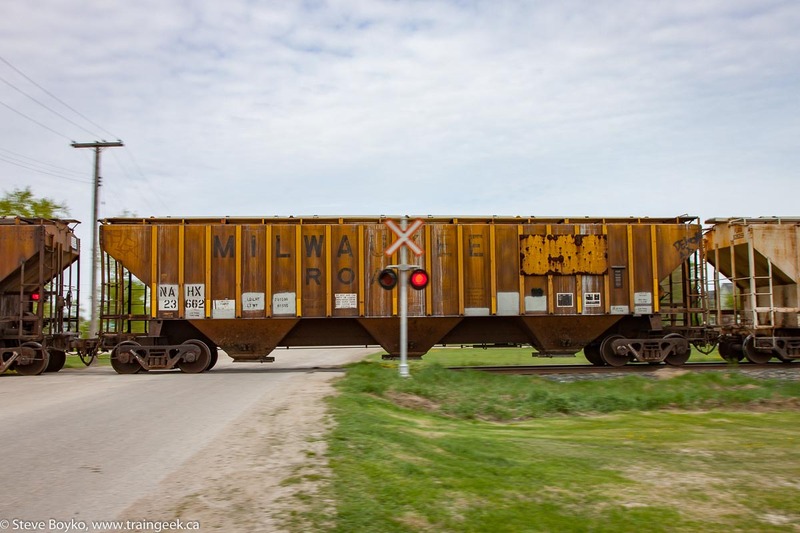 Quite the patch job on the car data on that Milwaukee Road car. "The Rock" was my favourite car, and it brought up the rear. There were a few other cars of interest to me on this train. I'm not sure who Cook Industries is/was... Google brings up a lot of things but none of them look like they owned rail cars. I've seen Union Equity before, at the Paterson grain elevator in Binscarth, Manitoba. Continental Grain continues to be a very large company, one of the 300 largest privately-held companies in the US. This one looks interesting but I can't quite determine the former owner of this car. Any ideas? 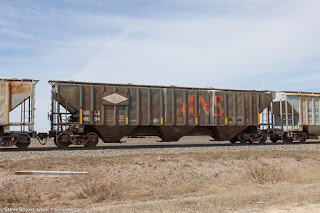 This is a former Minneapolis, Northfield and Southern Railway car... I photographed brother USLX 8034 in Grande Pointe, MB not too far from here on April 28, 2016. This train was interesting to me because of all of the varied cars in the train. 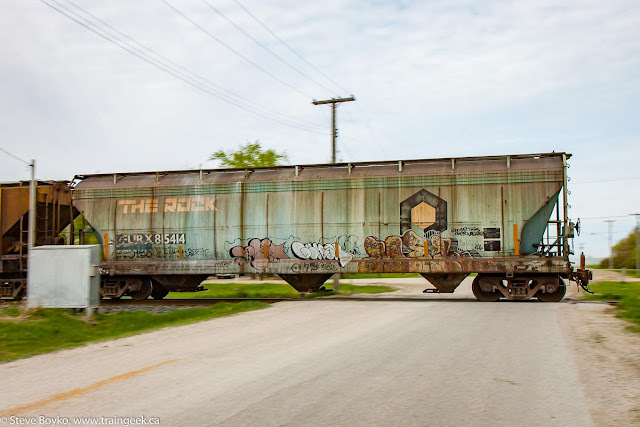 It was a nice change from graffiti-festooned boxcars and autoracks, or solid blocks of towering containers. Sadly these trains won't last that long as many of these cars were built in the early 1970s and will be coming to the end of their mandated 50 year lifespan soon. Shoot them while you can! Oh, and that collapsed building I stopped for? Here it is. I think it might be done. 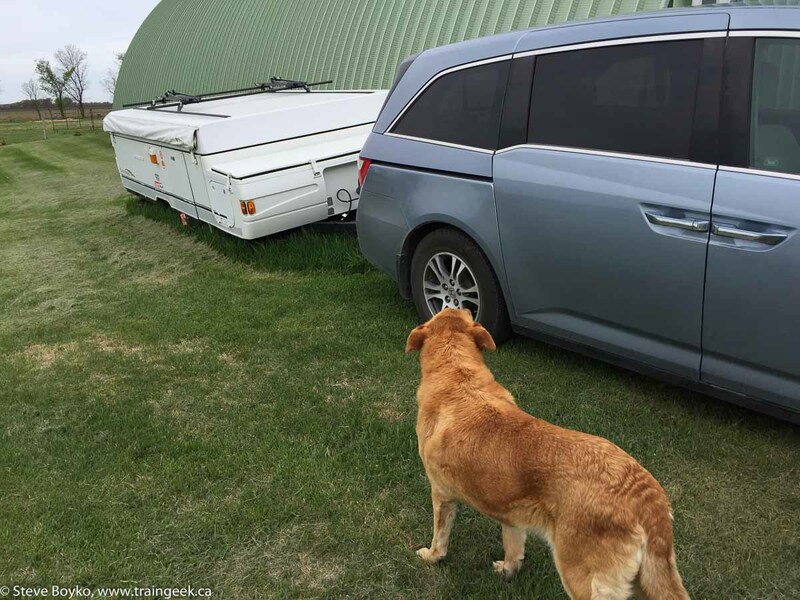 Here's my trailer, attached to my van and being inspected by one of the farm's dogs. Thanks, Dale, glad you liked it! Wow. What a gold mine in one train. I agree that the Rock might be the best of the lot. 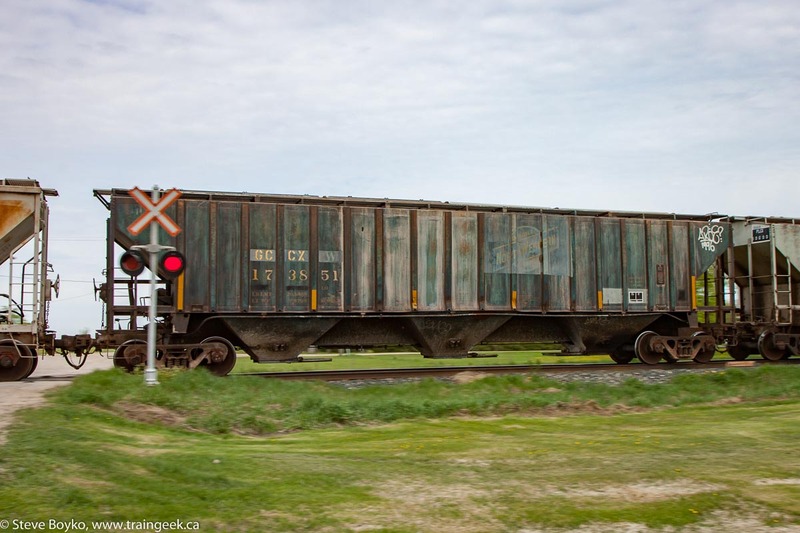 I've seen a few of the old C&NW hoppers (AOKX) in Ottawa. I agree that we should all grab any fallen flag rolling stock while we can. These are the trains I live to shoot. Great catch. Hi Michael, happy you liked the train. 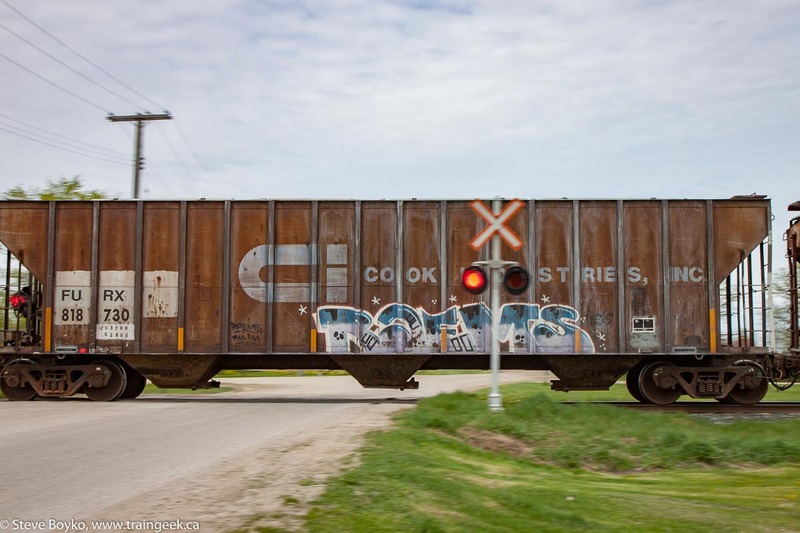 I have seen a few AOKX C&NW hoppers here and there. It was nice to see so many fallen flags on one train! Learned a new term today! I was at Nordegg yesterday they have an old rail car there that I thought was neat. It said Manitoba on it with the buffalo symbol. I'll post it soon! 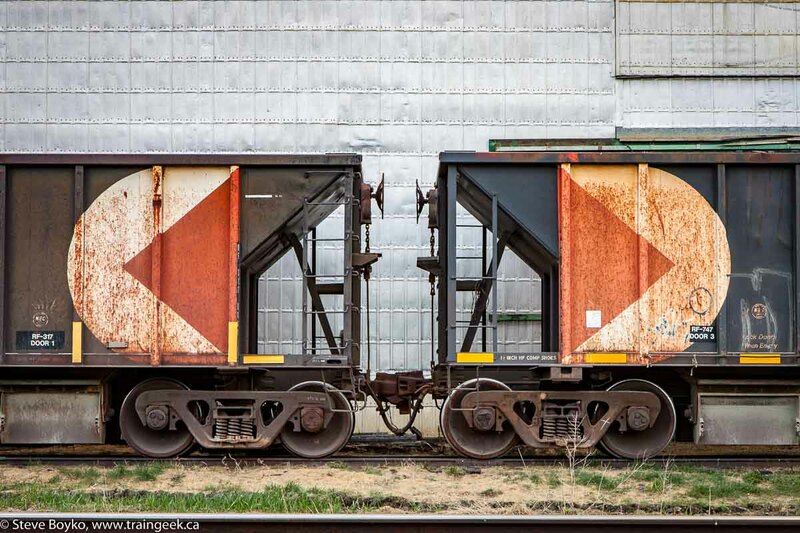 I should have added that the the leased cars were hopper cars. There were also box cars owned by CN that were rebuilt with federal and provencial money for use on the Churchill line and had Manitoba and Canadian government logos on them. Hi Jenn, can't wait to see your "Buffalo box"! That's the nickname for the Manitoba government's grain boxcars, used on branch lines and later just to Churchill. 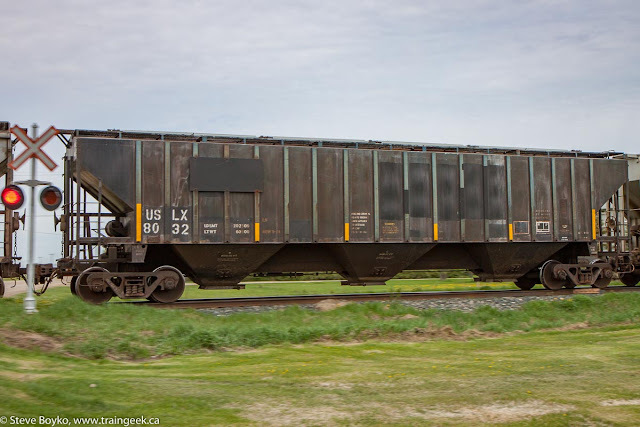 Hi mbhydro, did the Manitoba government put the buffalo logo on cylindrical hopper cars? 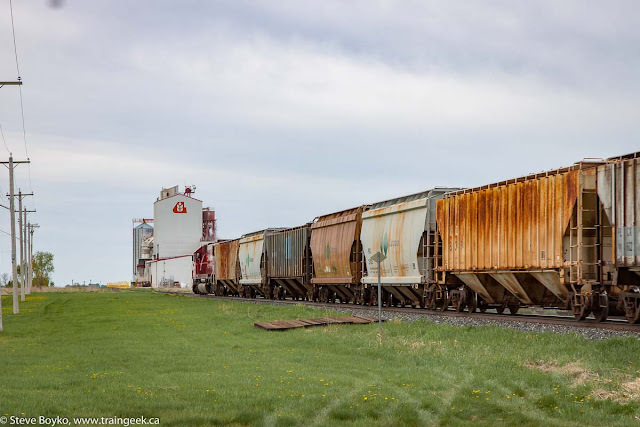 Like the fallen flags, love the rolling stock. Thanks, Eric, for confirming that there was only one "buffalo hopper". 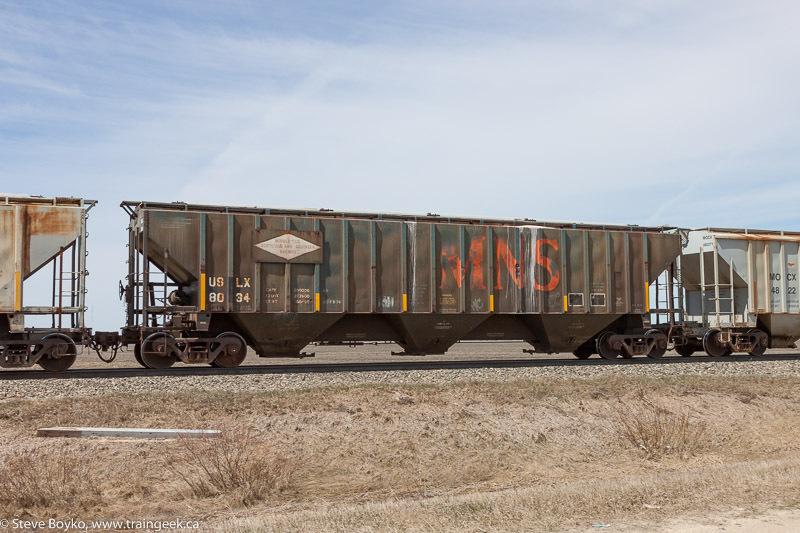 You're right about the MNS hopper. 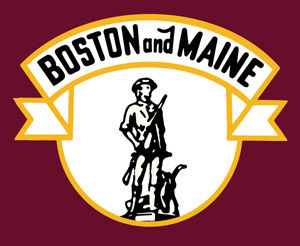 I looked in my own library and USLX 8034 still has its MNS logos. Hi Patrice, thanks for your post and your "wild guess". That was a good guess but I think Eric is right. Fascinating about the fallen flag rolling stock - amazing to see a Milwaukee car and one from the Rock Island. I can with 99% certainty say your Rock Island car is an FURX. Not sure if that is just a typo or not ... F and G being so close! I too, love seeing these cars. There are quite a few ex CNW and RI cars still roaming the rails! I know Eric loves his Great Lakes Carbon ones!